This week, my perennial orchid that grows outside bloomed agin, which was really quite a remarkable feat considering that it was 32 degrees here in Atlanta on Tuesday night. I owe this particular triumph to my gardener, Gabe Horrisberger, (404) 906-6299, if you can reach him and talk him into working with you. Several years ago, Gabe knew that I loved my orchids so somehow, in his many trips to various garden centers, he was lucky enough to come upon an outdoor one. He surprised me with it and I have been delighted ever since. This outdoor variety only blooms once a year, but never mind. Literally 12 months a year I will be out in my garden examining its various incarnations, watching as it divides itself naturally, blooms and fades away all the way into the ground until a lesser, less fevered gardener than myself might think she had somehow failed and that my dear orchid had died completely. Even though this orchid is deciduous, it manages to resurrect year after year, which was a remarkable feat given the winter we have all suffered. I owe my orchid fever to my dear friend Margaret Price, a school bus driver in Savannah, Georgia. Years ago, Margaret came to visit me here in Atlanta and she brought me my first orchid, a purple spotted phalaenopsis from Home Depot. To my surprise, somehow my first orchid bloomed continuously in my healing studio for six months! Wow! After that, if I was out and about, I started collecting more orchids. Home Depot at first (now that I have become an insufferable orchid snob I would probably never go there again to purchase a new precious baby). Whole Foods. Kroger. 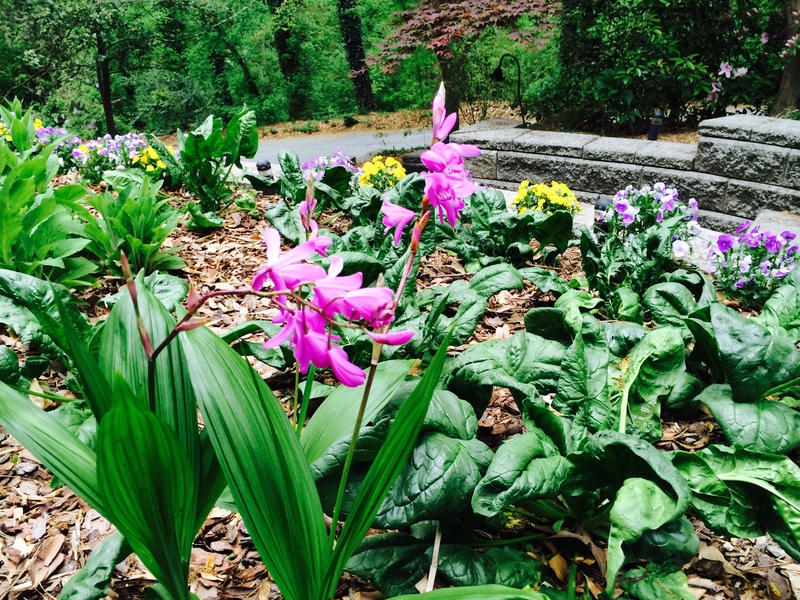 Finally somehow I realized that the healthiest orchids in Atlanta come from the Atlanta Botanical Garden, duh! And then I found out that the Atlanta Botanical Garden gets theirs from Peachstate Orchids in Woodstock, although I have never managed to find the time to schedule an expedition up that far. And finally I realized that the Atlanta Botanical Garden has orchid shows where you can acquire some truly exquisite varieties if you set your mind to it. So things were going swimmingly in my orchid world and to my next surprise and utter delight my friend Don Dennis, who raises orchids in Scotland to make healing remedies, invited me to his castle for FREE in 2009 to study with five other healers around the world. You can read about Don’s amazing work at Healing Orchids. This was quite literally the trip of a lifetime, an ecstatic experience to be with Don’s orchids and also the other healers from around the world. I was truly among my tribe at last! We took Don’s flower essences made from orchids and meditated every day, discussing the effects of each orchid remedy afterwards. I stepped into the greenhouse. It was 70 degrees and maybe 80 percent humidity. Before leaving for Scotland, I had what I referred to as low orchid self esteem. I thought surely Don’s orchids would be more amazing than my own. I promised myself that I would purchase a very special orchid when I got home to commemorate my trip. On coming home and looking at the orchids that fill my soul literally every day I work, however, I recognized that my orchids are just as magnificent as all the other orchids all over the world. After I got home, I sent my five healer friends who I had met in Scotland a photograph of my studio with the orchids in the window. “Nice angel,” my new healer friend from Brazil wrote me back. “OMG,” I thought. It was true! I had taken a photograph of an actual angel floating above the orchids in my studio. I ultimately used this photograph on the cover of my book, What Is Healing? Awaken Your Intuitive Power for Health and Happiness, which went to No. 1 on Amazon in two categories in October 2013. I have since taken many photographs with my iPhone of angels all around my studio and home. “Of course,’ I say to myself when I see the angels in my pictures. Who wouldn’t want to hang out with all those beautiful orchids? In Scotland with the other healers, I learned that orchids are the most evolved flowers on the face of the earth. As such, they are the highest expression of the flower kingdom. That’s why Don Dennis can make such powerful healing remedies from them. What is healing? Healing happens when we discover the orchid that raises our vibration to such a height that illness or disease is no longer possible.